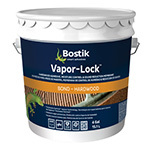 BOSTIK BST SUPERTAK (5 gallon) represents a breakthrough technology in urethane. This product offers the exceptional physical and chemical properties of a urethane, but at a water-based price. BST is a one-part, trowel-applied, moisture-cure urethane with unsurpassed green strength and ridge holding capabilities. It trowels easily and, once cured, is not affected by moisture or water. Because of its superior elongation and bond strength, BST can be used to install solid as well as engineered flooring.